The viola part for Bruckner's Symphony No. 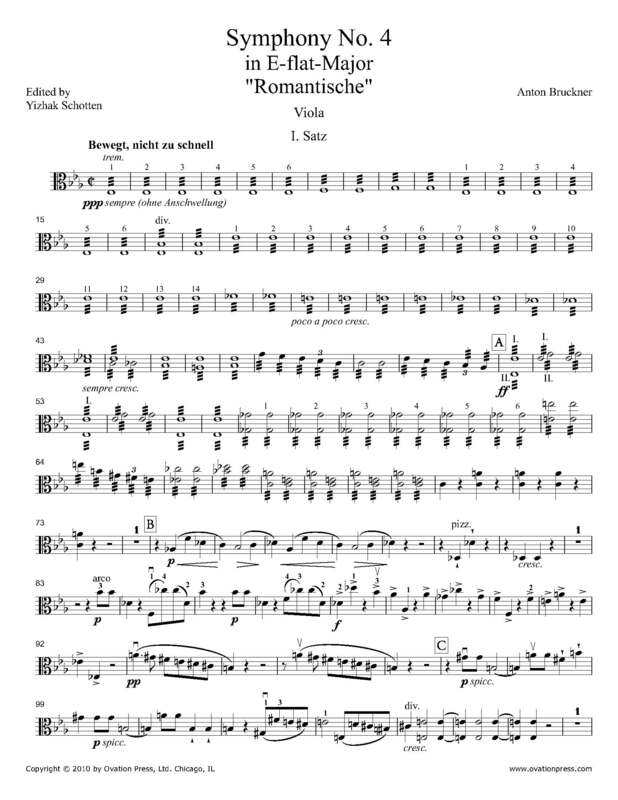 4 in E flat major, WAB 104 has been edited by Israeli-born Yizhak Schotten, an internationally acclaimed musician whom STRAD Magazine has called "one of America's finest viola players... a leading light of the U.S. viola establishment." Schotten's bowings, fingerings and other editorial markings have been added throughout the score. Bruckner's Symphony No. 4 is one of the composer's most popular works. It was written in 1874 and revised several times through 1888. The symphony premiered in 1881 to great acclaim in Vienna. Bruckner nicknamed it Romantic in reference to the medieval romance as depicted in the operas Lohengrin and Siegfried of Richard Wagner. Download and print the score today to gain access to expertly edited Bruckner Symphony No. 4 viola fingerings and bowings from Yizhak Schotten!